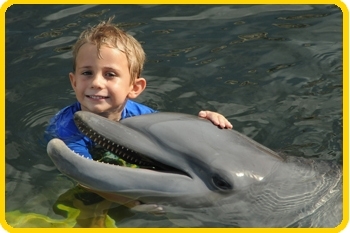 By popular demand, Dolphin Research Center now offers gift certificates for the Dolphin Encounter swim program. 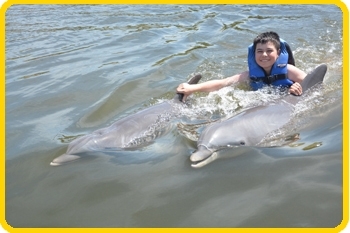 Delight your family and friends with an exciting opportunity to get into the water and interact with the dolphins in our most popular program. It's a gift they'll remember for a lifetime! Certificates can be purchased in person at DRC or give us a call at 305-289-0002 (M-F, 9:00 am to 4:00 pm eastern time) and we'll mail the certificate packet out to you or the recipient of your choice. Each certificate is good for one year from the date of purchase. No blackout periods. Regular guidelines for age and other requirements to participate apply. 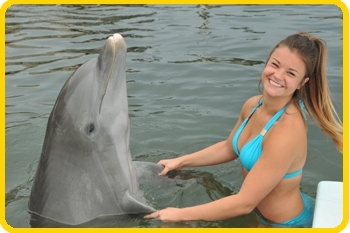 Find out more about the Dolphin Encounter program.